Fans of the Norwegian extreme melodic genre in general, and of Cor Scorpii in particular, have waited ten long years for the follow up to the band’s critically acclaimed debut album “Monument“. And now, at last, the long wait is over with the band set to release their sophomore full-length “Ruin” on the 15th of June 2018 via Dark Essence Records. “Ruin“, the result of a lengthy, and at time arduous, songwriting process, draws its inspiration from classical music, folk melodies and the soundscapes of Nordic extreme metal. This time the band also introduces instruments atypical in metal, such as the accordion and the mandolin, revealing hidden talents amongst the band members. 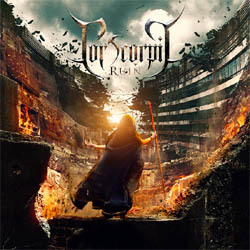 Cor Scorpii was founded in 2004 as an offshoot from the legendary Windir, and during the 10 years since the release of their debut album, the band has seen the arrival of a new lead guitarist Erlend Nybø (Funeral). “Ruin” was recorded at various locations over a period of three years. As with Cor Scorpii’s debut album, Børge Finstad performed the mixing duties to perfection in his Toproom Studio. Mastering was done by Tom Kvålsvoll in the nefarious Kvalsonic Lab. The young and incredibly talented classical singer Annika Beinnes contributes guest vocals on three songs. The album also features the clean vocals and occasional growl of Mats Lerberg (I Swear Damnation, ex-Funeral) guesting on three songs. With this release, Cor Scorpii gives you an honest and unpretentious work of Norwegian metal. Step into a world where ruins are monuments, and where epic and soaring melodies blend seamlessly with the harshness of extreme metal. The road to ruin begins with the building of monuments! The band has just unveiled the cover artwork by Novans V. Adikresna of the Marnov Studio, and the album tracklist. “Ruin” will be released in CD, Double LP and Digital formats and is already available for pre-order at their label’s webshop (also US Webshop) and at the band’s official Bandcamp page.